The Open Notebook – Peep Ye, Peep Ye! 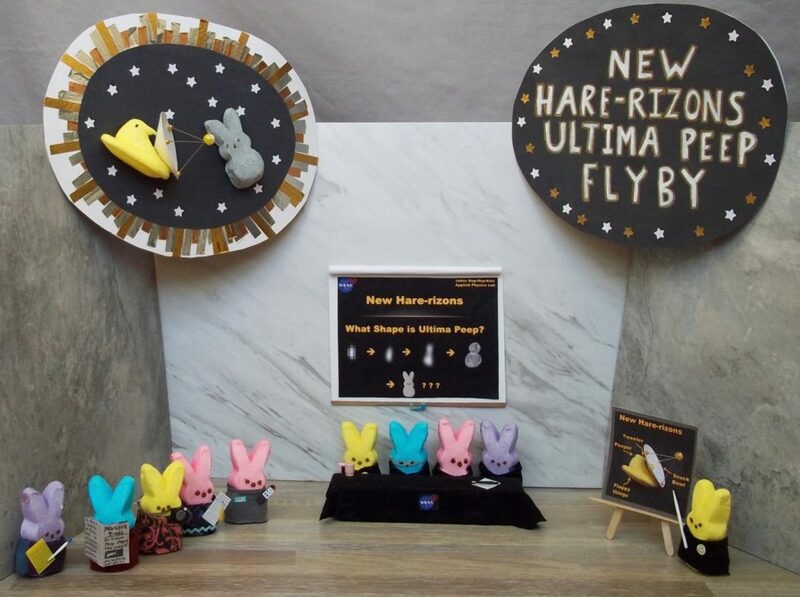 Announcing the Winners of the World’s Finest Science-Themed Peeps Diorama Contest! A Huge Thank You to Our Judges! Without further ado, here are the winners and honorable mentions, along with comments from the judges and crafters themselves. 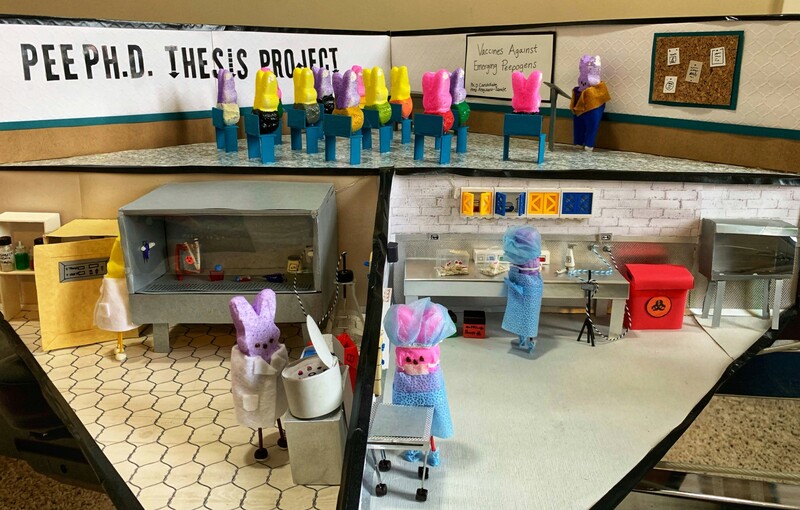 What the judges said: We appreciated that the diorama addressed a social topic as well as the science, and we admired the use of multi-colored Peeps. Rather than simply recreating a scene, the diorama expanded on the themes of the movie. We love the attention to detail, including costumes, items like mugs, notes, and blackboards; and the background with a NASA logo. Also, everything was nicely made. Crafters: Ella Theoharis (14) and Sam Theoharis (17), Fayetteville, New York; Jeanne Theoharis, Professor at Brooklyn College-CUNY, Brooklyn, New York; and George Theoharis, Professor at Syracuse University, Fayetteville, New York. What inspired you to make this diorama? Each year for about four years, we make a Peep diorama. We look for a project that mixes a political message with a contemporary issue. We particularly look for ideas where we can do a variety of details in the diorama. 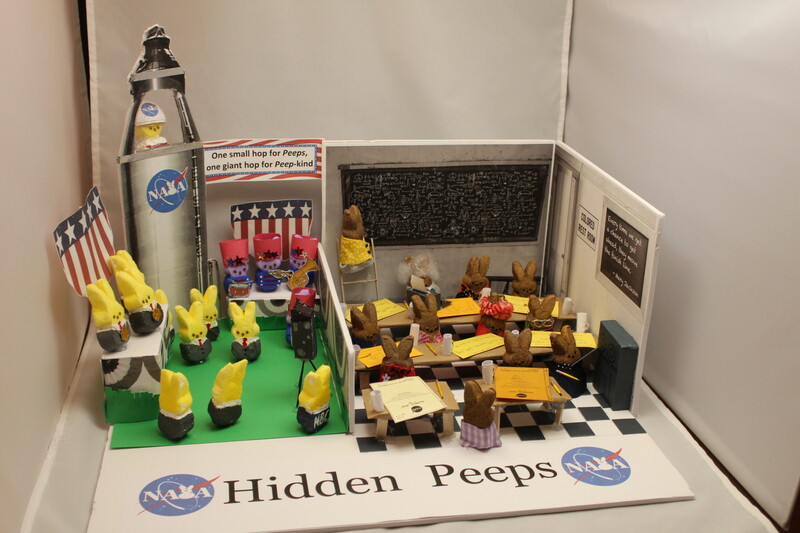 With The Open Notebook call to have a science theme, Hidden Figures (Hidden Peeps) was perfect. We could create a feminist celebration of the unsung black women who made such important contributions to the scientific space program with all kinds of Peep details. What did you find the most fun about crafting with Peeps? Most challenging? We love the details! We love making clothes and outfits and putting in fun little details, like Peeps puns or pencils, news cameras, etc. We love making a Photoshopped image—taking something real (like the NASA logo) and adding a Peep; we like using realistic black-and-white backgrounds to make the Peeps and details pop. Most challenging: Sometimes it is tricky to get things to stick to the Peeps with their sugar coating. 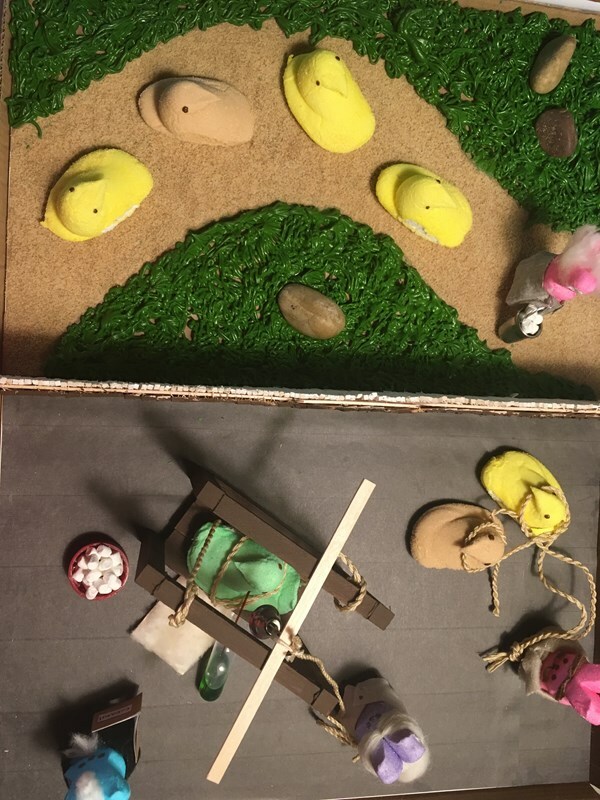 What advice do you have for others who want to make Peep dioramas? We have found making clothes to be really fun. We spray-paint the entire Peeps when we want different skin tones. We like a mix of painting clothes and making clothes from fabric, etc. 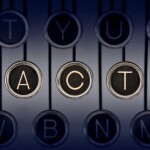 Is there anything else people should know about you or your diorama? We have been making Peep dioramas for about four years. Ella, aged 14, is the leader of each project. We find it delightfully ridiculous. What the judges said: We appreciate the meticulous representation of specific scenes—three specific scenes! We love her close attention to detail, which rewards close viewing; her use of lab materials; her careful construction; and her excellent representation of several aspects of a graduate student’s life in science. Stephanie Anguiano-Zarate, Ph.D. student at the Mayo Clinic Graduate School of Biomedical Sciences, Rochester, Minnesota. My fond love of miniatures and my interest in the intersection between science and art. I am also an aspiring science communicator and this was an excellent opportunity to showcase my Ph.D. research. The most fun was painting all the Peeople (scene 3) who are attending my presentation about my thesis project. I also love the fact that Peeps are made in different colors, which can represent diversity. As a member of an underrepresented community in STEM, it was a great opportunity to showcase that anyone, regardless of what race, identity, and defining characteristics, can be a scientist. The most challenging was making near-accurate laboratory clothes that fit the Peeps. They are loads of fun but do require dedication. It’s all in the details! Think outside the box! A large portion of the supplies used to make my diorama was recycled and included repurposed laboratory supplies. The small biohazard waste bag inside the biosafety cabinet in scene 1 was made from a cookie bag (Yes, I had snacks during the 52 hours, spread over one week, it took to create this, LOL). Both biosafety cabinets light up; the one in scene 2 lights up a blue/purple color to simulate UV light for hood disinfection. The legs of the rolling, grey cart in scene 2 are made from blood lancets and the mice in that scene are made from tiny craft pompoms. I also used surgical mask face shields to make the mouse cages (scene 2), the tissue culture flasks (scene 1), and the windows of the biosafety cabinets. This has been one of the most entertaining projects I’ve ever worked on! What the judges said: We were overwhelmed by this exuberant interpretation of the periodic table, with more jokes and puns than can be relayed in the entry form. 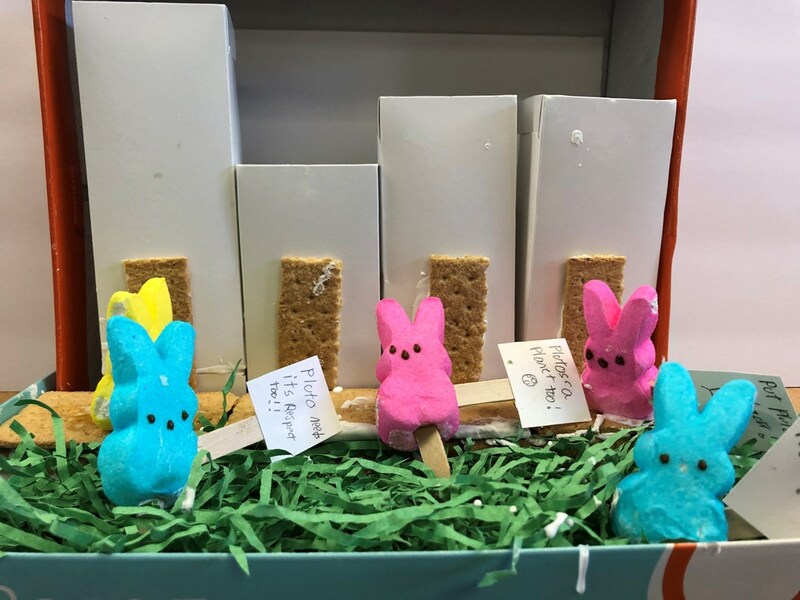 We appreciated the thoughtful use of a variety of Peep sizes and colors, and that the project was scientifically accurate and highly collaborative. Sally Mitchell, Rye High School chemistry teacher in Rye, New York; 74 chemistry students and ChemClub members. Mentored by Mary Virginia Orna, professor of chemistry at the College of New Rochelle. The most fun we had crafting with the Peeps was allowing high school students to be creative again. They had fun researching their element, decorating it and then writing about their inspiration. As the day progressed, students came back after school to see the finished product. The most challenging part of the project was finding all of the different colors of Peeps. I was able to find every color and flavor in my hometown of Syracuse, New York. I made two road trips to get more Peeps. 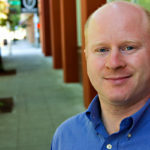 My advice to others: Involve others in the project. Share ideas and the diorama will have lasting memories. You can see patterns in the periodic table through our Peeps. Give it a look. We are planning to do much more with our Peepiodic table—watch for us on YouTube. A close-up view of Goodall and her notebook. What the judges said: The carefully made diorama represented its own unique aesthetic. It is evocative, making us think about a particular place and time. We love the use of the Barrel of Monkeys and the attention to detail—look at Jane’s notebook and pencil! Lucy Higgenbotham, Sacramento, California, elementary school student in 6th grade. What was the most fun thing about crafting with Peeps? Most challenging? What I liked most about crafting with the Peeps is being able to do almost anything you want with them. There weren’t many requirements on what needed to be in your diorama, which made it unique and more enjoyable than your average school project. The most challenging thing for me was getting my diorama to stand. It is displayed in a shoe box and I didn’t really want to have closed-in sides and have to work in the tight corners, so cutting them off made it difficult. However, I was able to make a tree with a twig to hold the box up! Well, I did make a lot of the objects/accessories featured in my diorama. The only store-bought things in it were the monkeys, the flower, and the grass. (And the Peep of course.) 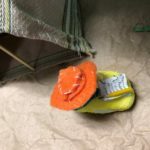 I sewed the tent and made the hat, bandana, and notebook with the pencil for my Peep. I really enjoyed doing the project, and I hope that other people will want to try it. What the judges said: Those of us who have attended NASA press conferences loved the accuracy and details, from the layout of the room to the reporter who isn’t paying attention. Comparing Ultima Thule’s shape to a Peep makes perfect sense. We appreciated the liberal use of Peeps puns and the un-science meme on the satellite illustration. We also thought the title and explanatory cards were really nicely done. 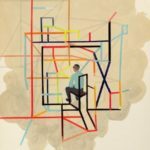 Emily Conover, Washington, DC, physics reporter for Science News magazine. I’d been following the updates as NASA’s New Horizons spacecraft got closer and closer to the distant Kuiper Belt object, Ultima Thule. As its shape became clearer, it went from blob, to bowling pin, to snowman. I realized it was only one step away from being Peep-shaped: It just needed ears! So I imagined a world in which the Peeps were studying this object and speculating about whether it was actually the shape of a Peep. Since I’m a journalist, I decided to make the setting a press conference with Peep reporters. I had never made a Peep diorama before but I may be addicted now. I had so much fun making their clothes and tiny objects for them to hold. It’s capeeptivating to see them come alive as you start adding little details. 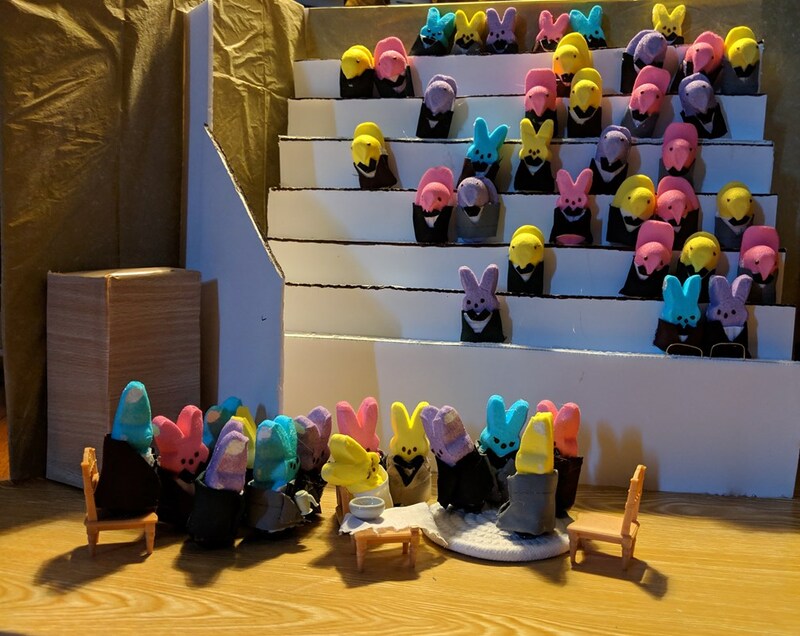 The most challenging part was that most peeple did not share my newfound passion for Peep dioramas, and I had to supeepress my desire to talk about it all the time. Just keep pecking away at it! 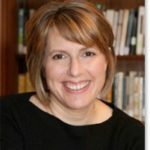 And a practical suggestion: Take them out of the box the day before you want to work with them, because they are easier to work with when stale. For example, you can use a nail file to shave down stale Peeps’ butts to make a flat surface so they will stand up well. I had Peep-related dreams throughout the process of creating this. 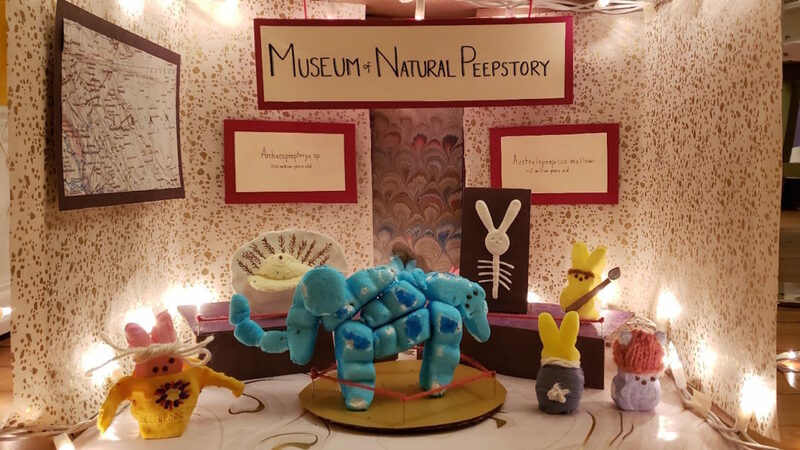 What the judges said: We loved the many ways the team used Peeps: as both museum visitors and museum displays. Turning Peep pieces into an elephant was a stroke of genius. The construction, costuming, and attention to detail were all wonderful. One judge noted how clever it was to include an anthropological diorama within a diorama. Shaena Montanari, AAAS Science and Technology Policy Fellow; Maryam Zaringhalam, AAAS Science and Technology Policy Fellow; Kate Furby, science writer/producer; Anna Rothschild, host of Anna’s Science Magic Show at The Washington Post; Sarah Kaplan, reporter at The Washington Post. All crafters are from Washington, DC. Most challenging was cutting up Peeps and rearranging them into the giant Peepephant. Kate gets most of the credit for this incredible creation. The most fun part was collaborating with friends. We had an absolute blast doing this together. Watching everyone create tiny Peep fashions (mainly Anna knitting a hat and Maryam sewing silly clothing) was pretty hilarious. Sarah staged the scene perfectly and also made amazing brownies for us while we were constructing the diorama. Definitely do it, because crafting with friends is the most fun. It was a true group effort and we couldn’t have created something so magnificent without this special team! What the judges said: This diorama creatively represents a moment in history. 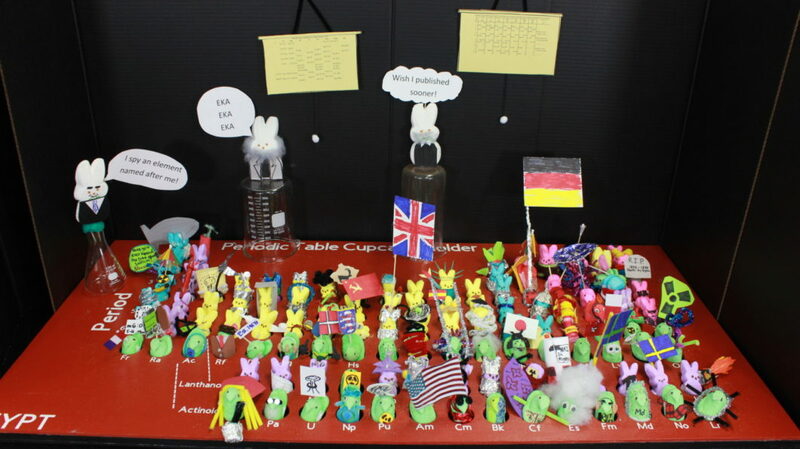 We love the use of the question mark Peeps to illustrate Mendelpeep’s room-to-grow version of the periodic table. We were delighted with the team’s attention to detail—many of the items in the diorama were hand-made. We liked how carefully the periodic table was made, even though it was tiny. Kerri Jansen, a multimedia reporter with Chemical & Engineering News, and Yang Ku, an art director with C&EN, were the project leads. And we had about a dozen C&EN staff members helping out at various levels with this project, from brainstorming to construction. A few of the remote staff in California and Germany even called in to help brainstorm. The diorama was constructed in Washington, DC. We’ve all had periodic table on the brain lately because 2019 is the International Year of the Periodic Table. The question was which moment to depict from the entire history of the periodic table and all of its 118 elements? I have this book called Mendeleyev’s Dream: The Quest for the Elements that ends on the image of an exhausted chemist falling asleep in the middle of his work, moments from finally unraveling the order of the elements. I’m not sure how much artistic license was involved with that description, but we were charmed regardless, and we picked that dreamy moment for our diorama. I loved the slow reveal of my colleagues’ hidden crafting skills. 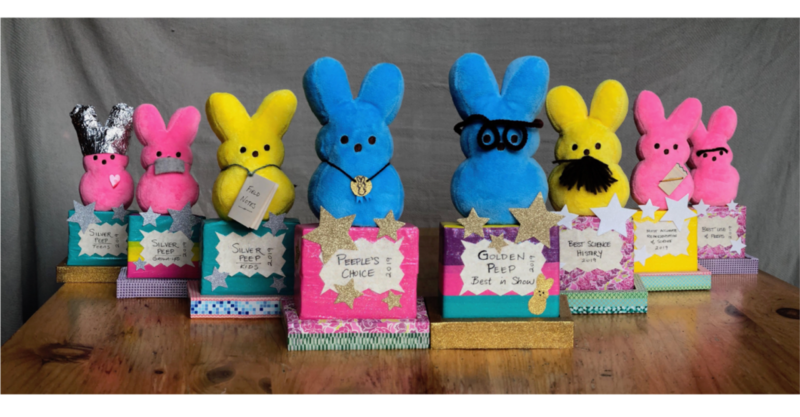 Now I know whom to go to for help building tiny furniture, or who is strangely good at making little drawings of Peep bunnies that look like famous historical chemists. The most challenging was filling the bookshelves with all of those tiny books, which was a multi-day effort. There are 100 in all. Every one was made by hand, at first lovingly and then with gradually increasing levels of lamentation and despair. Also, we could not find a glue that stuck well to the Peep. If any of the other Peep crafters out there know this secret, please share it with us. Order twice as many pizzas as you think you will need for the crafting party. This was truly a group effort. Every single person involved contributed something unique. 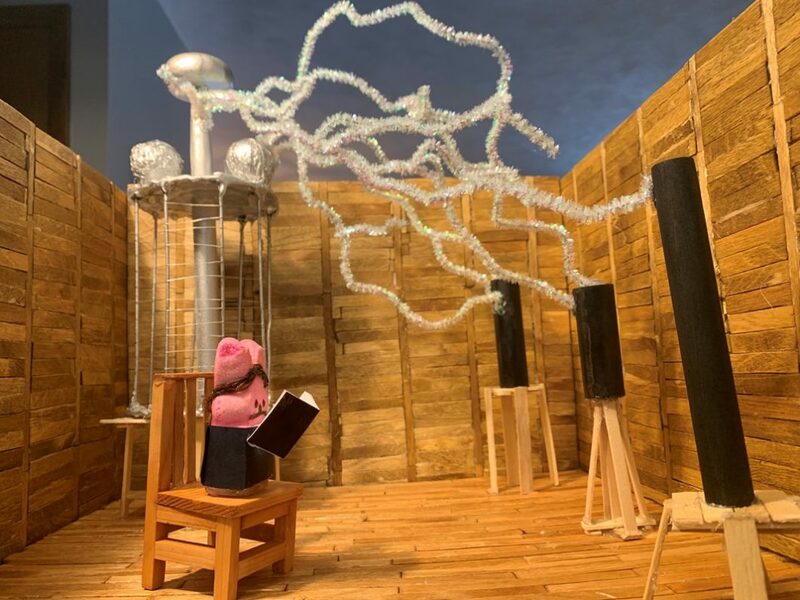 I want to extend special recognition to Yang Ku, who spearheaded the “dreamscape” portion of the diorama and built those miniature bookshelves in her office with a Dremel rotary tool. And we loved looking through the gallery of other entries! Peep crafters have a seriously top-notch pun game. What the judges said: The material’s incorporation added nicely to the scene’s dramatic aesthetic. Perched on the lip of a gateway into hell, this intrepid Icelandic adventurer has been exploring volcanic geology. Note the yellow-tinged sulfur near the lava vent and the authentic Icelandic rocks that form the heart of the diorama. (The ash particles are hand-collected from the 2011 Grímsvötn eruption.) 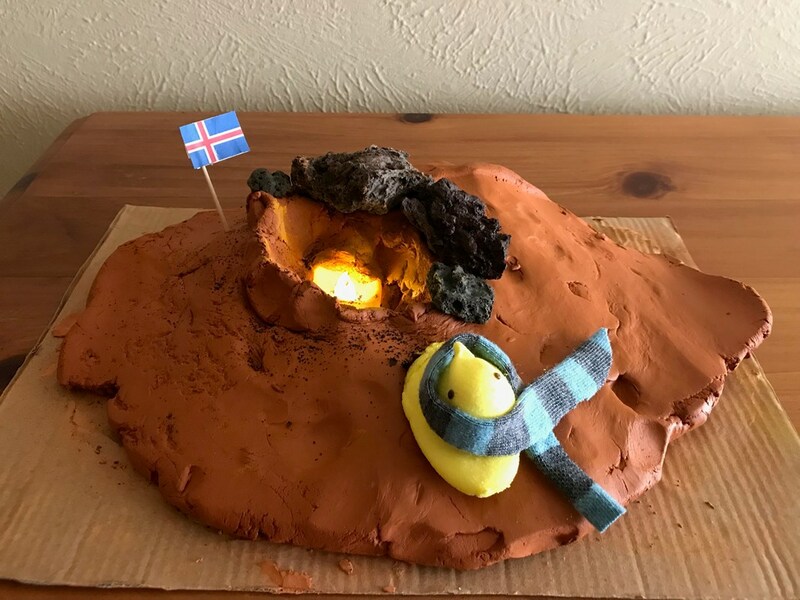 Our hero, Peep Peepdarson, wore a scarf for the Arctic climes but failed to observe safety peeptocols, resulting in some melting and singeing. It is possible that he will keep a greater distance next time. What the judges said: We were delighted at this young man’s enterprise in choosing to enter the contest; his crafting choices—in particular, the Lego vehicle and the marshmallow helmets—are signs of great dioramas to come. 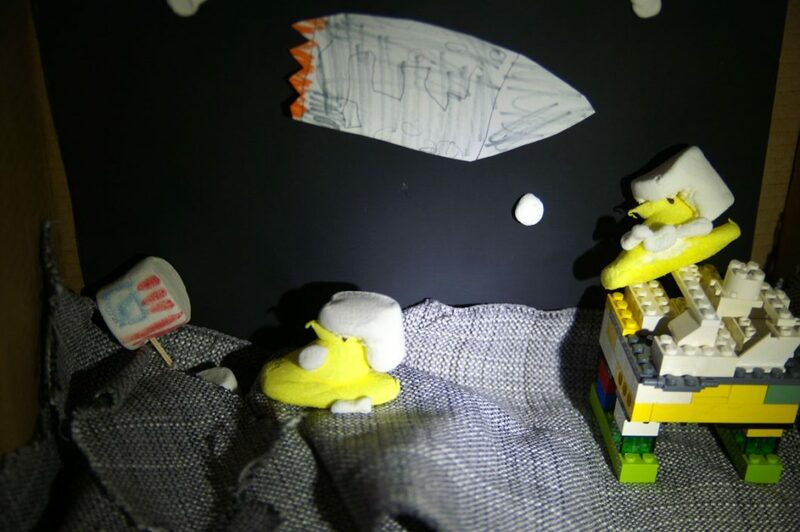 Ben (age 7) first researched the moon landing by reading an entry about it in the book, “Fourteen Amazing Journeys.” Ben constructed the Eagle Lunar Module in Lego, drew the shuttle in the background, and created a marshmallow flag. Peeps were kept safe in oxygen-deprived environment with their marshmallow helmets. All peeps and marshmallow material were safely retired into Ben and his little sister’s stomach. Peeps protest Pluto. Give the little guy a chance. 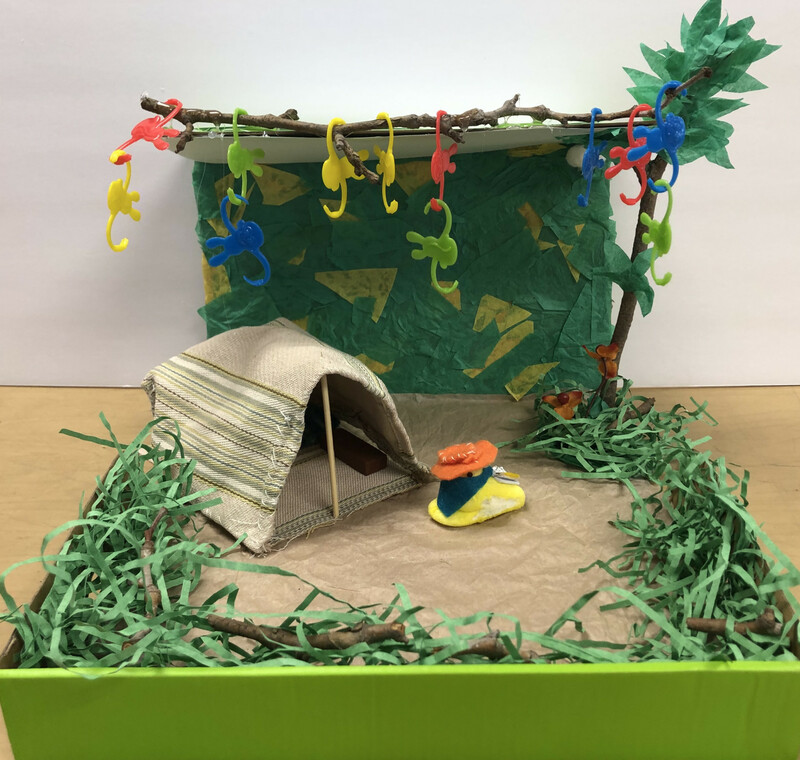 This diorama was made by EJ, a student in Mrs. Natalie Tamblyn’s 5th/6th grade class in Sacramento, California. Students in this class made Peeps dioramas about scientists who they chose to profile, and also wrote essays about their chosen scientists. 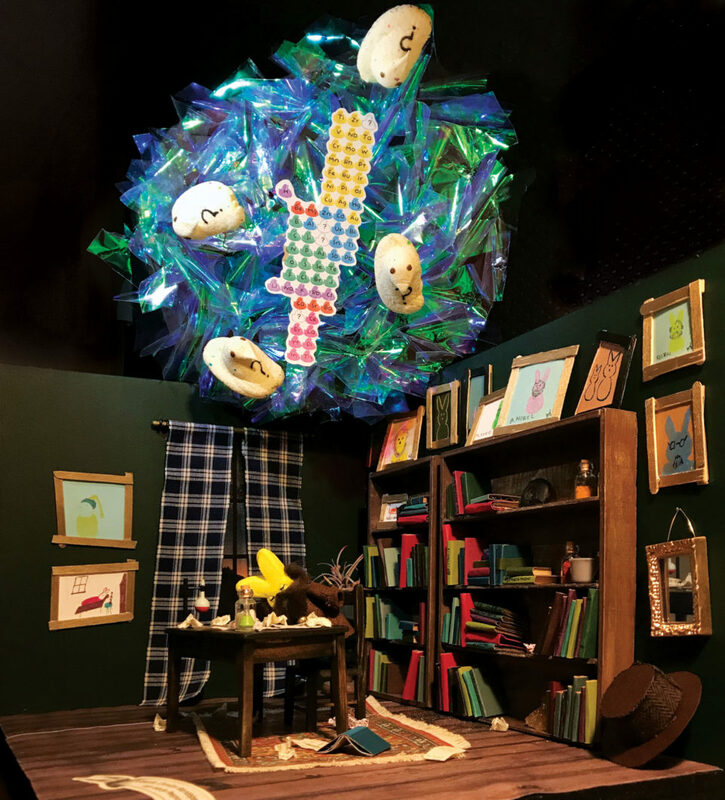 14 students submitted dioramas to the 2019 contest. Chipeepwa Falls, WI – Snowshoe Peeps have hopped around the upper half of the state for centuries but now face challenges from historic ranges lacking snow cover. When molting from their mottled, cocoa brown fur into dense, winter white coats, they have found no snow to camouflage them. According to researchers from University of Wispeepsin, Snowshoe Peeps have been found at just 28 of 126 previous survey sites. Climate change deniers poo-poo the problem and point to the recent Peeplar Vortex as ‘proof’ the globe is not warming, yet scientific data tell us that Snowshoe habitat has moved north 5 ½ miles per decade. Note a Snowshoe Peep loafing in his meuse at sunset; another hiding on the hilltop; another telescoping on her large feet. Meanwhile, ecologists and citizen scientists look for Snowshoe Peeps. With substantial snow cover, the lagomorphs can be difficult to see. Tracks, chewed bark, and poops offer clues. What the judges said: We’re still pondering this one. Is the Peep alive in that microwave at this particular moment?!? 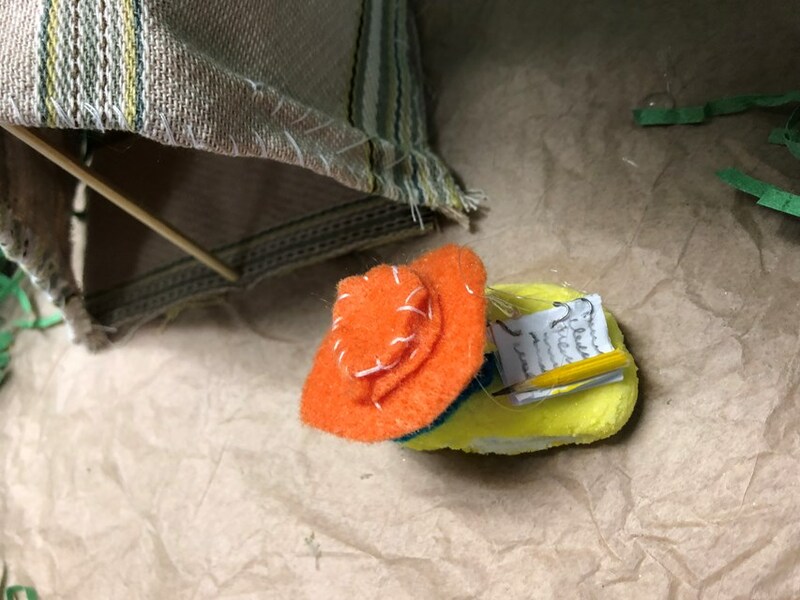 What the judges said: This studious Peep was instantly recognizable as Tesla, even without the accurate representation of the rest of the famous photograph. A tribute to Nikola Tesla’s magnifying transmitter, this diorama shows Tesla sitting in front of the transmitter in his lab calmly reading a book. The transmitter was one of his most famous and important inventions. 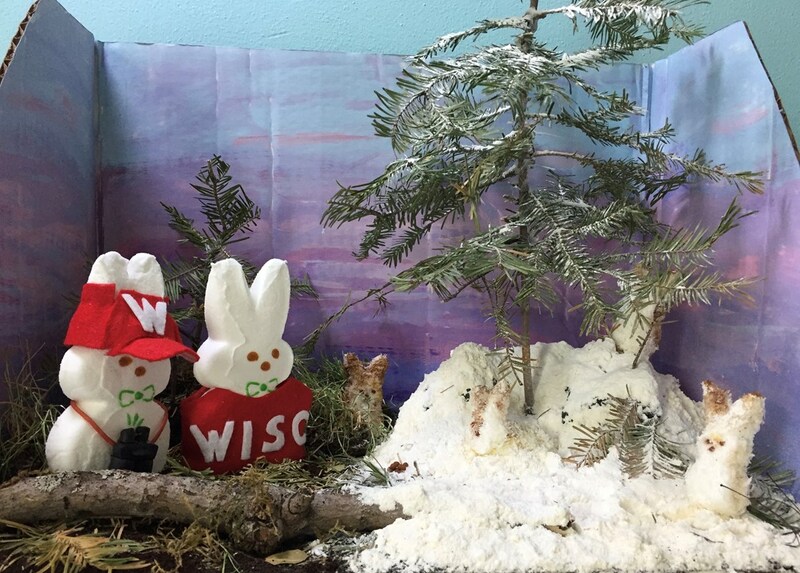 Two teens created this diorama. They came up with the idea, designed, and built the display all on their own over lunch periods in school. No teacher input or assistance was required or used. 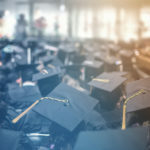 What the judges said: From Ada Lovelace’s headdress to Brian May’s scholarly cap and gown, from the jacquard loom cards to the telescope, this story is told—delightfully—through the details. —Ada Byron Lovelace, a mathemapeeptian who wrote the first computer algorithm. She is seen with the jacquard loom punch cards that inspired her programming process, and chalkboard equations from her Notes on Menabrea’s Sketch of the Analytical Engine. —Charles Babbage, a polypeep who invented the Difference Engine, a mechanical calculator designed to generate numeric tables based on Isaac Newton’s method of “divided differences,” as well as the much larger Analytical Engine, which was never fully assembled (in our universe, anyway). —Brian May, an astropeepicist who studies the Zodiacal Dust Cloud, was a university chancellor, authored books about the cosmos and stereophotography, and played lead guitar for the popular rock band, Queen. What the judges said: We all agreed that this was a perfect way to explain a complicated scientific process—and entirely appropriate to the medium of marshmallow. CRISPR/Cas9 laboratory to illustrate the concept to a general audience using diversified Peeps. 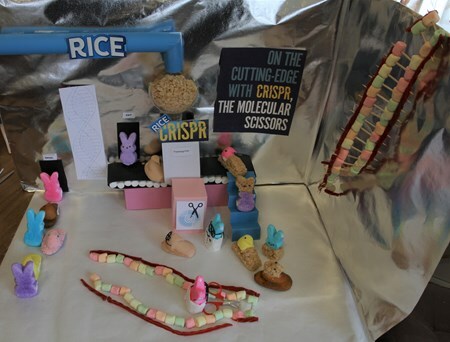 We used the pun of Rice CRISPR because we thought most people would be familiar and would find humor with the use of Rice Krispies treats. We also used a marshmallow conveyor belt and marshmallow/Twizzler DNA, a crisped rice funnel and Calvin and Hobbes transmogrifier, as well as a Peep scientist cutting DNA to symbolize the ease of cutting and pasting changes to DNA. Scientist are briefing peeps before going into the Rice CRISPR and new Peeps are hanging out with their new DNA look. 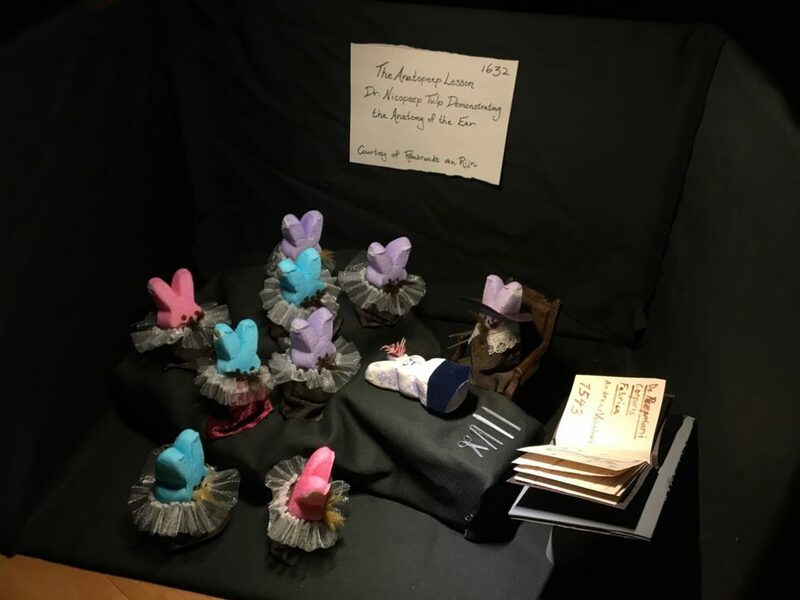 What the judges said: Both had perfect costuming, lighting, and arrangement (several judges particularly noted the evocative posing of the main characters in the “Peep”eration scene), entirely reminiscent of the paintings on which they were based. In the spirit of medipeep discovery, we reimagined the iconic Rembrandt painting “The Anatomy Lesson of Dr. Nicolaes Tulp” (1632), commissioned by the Amsterdam Surgeon’s Guild to commemorate the yearly dissection event, as an investigation of a Peep cadaver by our Dr. Nicopeep Tulp. Anatopeep study flourished in the 1600s and was important for both science—note it’s not just fluff in the cadaver’s ear—and entertainment. If you were good at dissection or illustration or both, anatopeep lessons and commissioned art or educational pamphlets were a good way to earn money. Among the figures, Tulp is notable for being seated, by his hat, and his flat lace collar rather than fanciful ruff as the onlookers have. The book is presumed to be the 1543 De Peepmani Corporis Fabrica. The Peep corpse is kept dignified with a loincloth. The incorporation of anesthesia during surgery represents one of the most important advances in the history of medical science. This diorama is an homage to the famous painting by Robert Cutler Hinckley, The First Operation with Ether, which depicts the first successful public demonstration of ether as an anesthetic during surgery. Though there is some debate over whether the surgery depicted here really was the first to demonstrate ether’s effectiveness, there can be no doubt that ether helped revolutionize surgery in the late 19th century and paved the way for the development of superior anesthetics that continue to relieve the pain and suffering of patients today. What the judges said: It rhymed! And it told us what we were seeing! In a farmyard where animals freely go. But an Austrian gentleman named Konrad Lorenz. Peeps’ physiology responded as well. Pavlov remains known for his studies on drool. What the judges said: The dramatically-lit photo through the peephole (ha!) was an excellent touch. Archaeologists have long known that Neanderthals, our hominin relatives, had fire pits. They believed the fires were lit by flames from lightning strikes. Recently, some scientists have come to believe Neanderthals might have created fire all on their own. Their stone tools display a wear and tear pattern that suggests Neanderthals struck them to create sparks. Not everyone agrees with this finding. But if true, it just adds to a growing list of Neanderthal accomplishments. Here is a group of Neanderpeeps enjoying a toasty fire in Gibraltar. The image at left is an overhead shot so you can get a better idea of what’s inside the shoebox.The scene is meant to be viewed through a peephole (ha), which is what you see in the close-up at right. 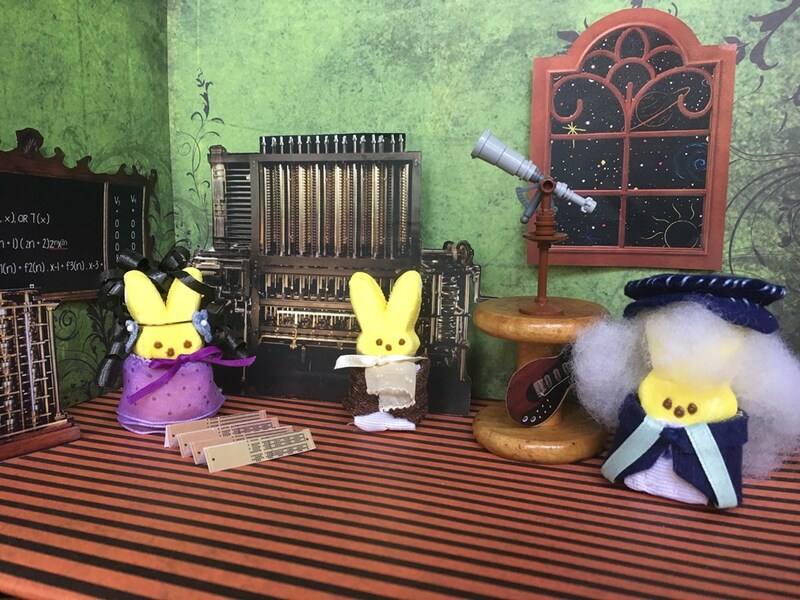 Read all about The Open Notebook‘s Peeps diorama contest here. See the full gallery of 2019 entries here. Support The Open Notebook here.